People are protesting the denial of mandate for the HDP co-mayors they have elected on March 31 in the Kurdish region. Turkey’s Supreme Electoral Board (YSK) has ruled that some district mayors elected on March 31 local elections, who had previously been stripped of office by Statutory Decree (KHK), will not be allowed to take up office. The HDP has accused the YSK of having launched a political conspiracy with the mentioned decision which affects HDP’s candidates for the Bağlar district in the south eastern city of Diyarbakır, and Tuşba, Çaldıran and Edremit districts in Van in eastern Turkey who will not receive their certification. In Edremit, Tuşba and Çaldıran the ruling Justice and Development Party (AKP)’s candidates were runners-up and will be awarded the mayor’s positions. Masses joined a demonstration in front of the Edremit District Municipality in Van province on Friday to protest against the YSK decision to give mandate to AKP mayor elect despite the HDP winning the municipality. Demonstrators who included HDP co-mayors, DTK representatives and HDP Van provincial branch co-chair Yadişen Karabulak, protested the YSK decision with a press statement and sit-in action. 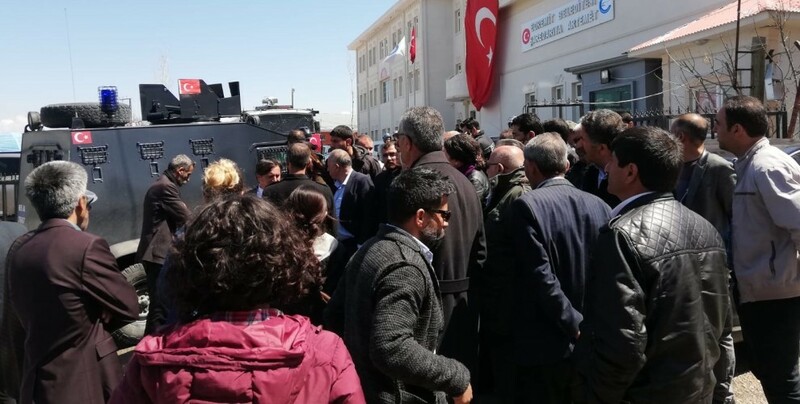 Speaking on behalf of the crowd following the sit-in, Edremit Municipality Co-mayor Gülcan Kaçmaz Sayyiğit stated that the will of the people has been seized once again on March 31. Police attacked the crowd as Sayyiğit continued her speech. The co-mayor elect stated that their struggle is not limited to municipalities but will continue in all areas.